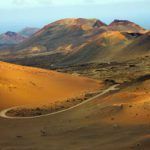 Cueva los Verdes is a cave located in the northern area of Lanzarote, in the municipality of Haria, part of the vast volcanic landscape of the Malpais Natural Monument of La Corona. The cave was formed as a result of a series of eruptions of La Corona Volcano (dated, according to geologists, some 3,000 to 5,000 years ago), which gave way to an extensive (some four miles long) underground volcanic tunnel, which extends from the volcanic crater all the way to the ocean. 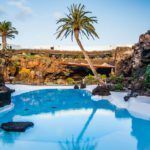 Two of the most important Centres for Art, Culture and Tourism, Cueva de los Verdes and Jameos del Agua, are both part of the interior of this tunnel. 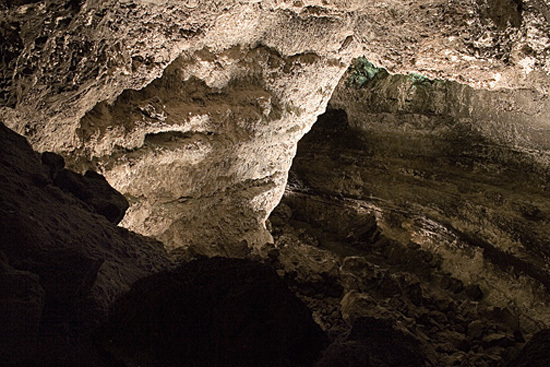 The partial detachment of the ceiling of a tunnel section forms the structure known as a “Jameo,” (a term of native origin), which in fact is no more than an opening in the ground which allows access to the various caves. 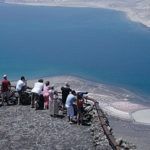 Four miles of tunnel extend from the volcano’s crater all the way to the shore, where for nearly a mile it continues underwater in what is called the “Tunnel of Atlantis” [Tunel de la Atlantida]. 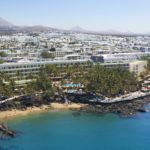 Fully aware of the unique aesthetic value of this site, geologists and historians during the 1960’s, together with the Lanzarote government, began conditioning the space for tourist use. 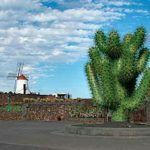 This ambitious project included the participation of the Lanzarote artist Jesus Soto. It is to him we owe the lighting of the cave, as well as the creation of the tour throughout its interior. The interior space has received little adaptation; the levelled area giving access to the exterior and the interior path were what received the most significant conditioning. Although the result is spectacular, the artistic adaptation, in maintaining respect for the environment, is limited to the introduction of light and ambient sound, both perfectly entwined with the serene environs. Jesus Soto, a very active observer, puts his extensive knowledge of light and shade on display, having meticulously investigated the appropriate way to illuminate and create a relief with the textures that cover the spectacular multicoloured ceilings of the Cave’s interior. Soto creates a chromatic atmosphere of artistic and natural spaces and environments with a strange poetic beauty. 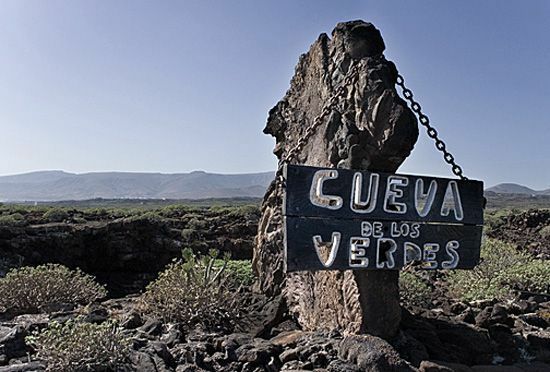 Another of the names that is closely associated to the creation of this Centre for Art, Culture and Tourism is the Lanzarote historian Agustin de la Hoz, who published his literary work “Cueva de los Verdes” in 1966, in which he describes the cave in thorough details, with a rather poetic tone after an exhaustive investigation. Also, he describes the different sections of the cave, introducing names from the island’s historic imaginary. Few experiences tend to be so interesting for a traveller, in terms of adventure and exploration, as is entering a cave. 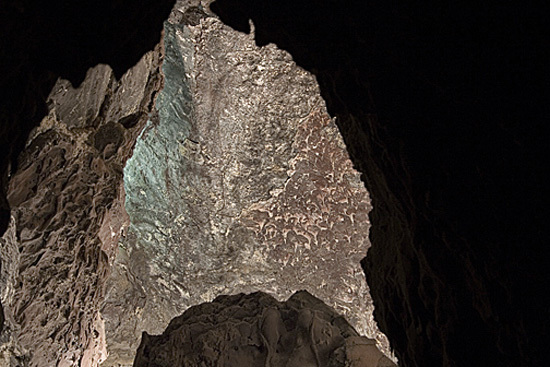 Without a doubt, visiting Cueva de los Verdes is a true voyage of discovery deep into the Earth’s entrails. This trip promises to be spectacular and unique. 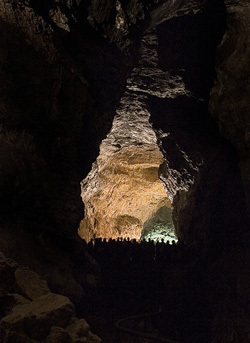 The path through the Cave is made up of miles of superimposed galleries with vertical interconnections between them. At certain points there are as many as three levels, allowing the visitor to discover new spaces from varying perspectives. The tour is completed in 50 minutes. Guided tours start every 20 minutes. The interior of the tunnel is some 150 feet [50 m] high, and up to 50 feet [15 m] in width. There are some peculiar stone formations and structures: lava channels, solid blocks drawn in by the current, huge lava formations, saline deposits, successive layers of solidified lava, etc. Particularly impressive is the wide range of colours adorning the cave’s ceilings and walls. The reddish colours are the result of the oxidization of the basalt stones’ iron content. The multiple ochre tones result from the light’s reflection on the fluorescent salts produced by water filtering through from the surface. You’ll notice the pleasant climate inside the Cave. The air current creates a light and agreeable natural ventilation, and the temperature generally hovers around 66º F.
Recommended hours: From 10.00 to 11.00 or after 15.30. Your visit will be much more relaxed at these times.